The Performer 600 performance-grade pro audio speaker cable guarantees a quality signal between your head and cabinet. 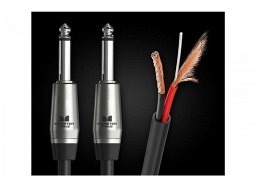 You can rely on Performer 600 Speaker Cable to transfer maximum power from your amp to your speaker system. Performer 600 Speaker Cable is high-performance pro audio cable that uses Time Correct Windings® and advanced cable construction to deliver an accurate signal with deeper bass and wider dynamic range for amp head/speaker combinations and other sound-reinforcement applications. Increased conductor area increases power transfer, and twisted-pair construction eliminates hum. Monster's world-renowned reputation as a manufacturer of high-performance audio products started with speaker cable more than 35 years ago. Monster's speaker cable is your assurance of absolute maximum fidelity and power transfer. Monster set the standard with the Original Lifetime Cable Warranty. Performer 600 pro audio speaker cable is covered by our 100% replacement guarantee, so you'll be a Monster for Life!